As HBCU Gameday celebrates its fifth anniversary, we look back on the players, coaches and moments that have helped shape its tenure and build the foundation. On Monday we started things off with the quarterbacks. We saluted the running backs on Tuesday. On Wednesday, we’re looking at the pass catchers from the past five years. The 2012 Winston-Salem State offense was a thing of beauty, particularly the passing game. Kam Smith’s primary target was Massey, a shifty speedster who hauled in 65 catches for 1,324 yards, averaging a ridiculous 20 yards per catch to go along with 15 touchdowns as he helped WSSU go 14-1 and make it to the NCAA Division II national title game. The other half of Southern’s historic passing tandem, along with quarterback Dray Joseph. Doss had a career year as a senior, catching 78 passes for 1,172 yards (15.0) and scoring 11 TDs. His efforts helped Southern beat Jackson State in the SWAC title game to cap off his career. Mississippi Valley is home to the greatest receiver in pro football in Jerry Rice. In 2014 it was home to the top wide out in HBCU football again as Julian Stafford caught 67 passes for 1,037 yards and nine TDs. It was also a solid year for JSU sophomore Daniel Williams who grabbed 73 passes for 1,009 yards and 11 touchdowns. Stafford gets the nod here simply because he was all MVSU had on offense that season. 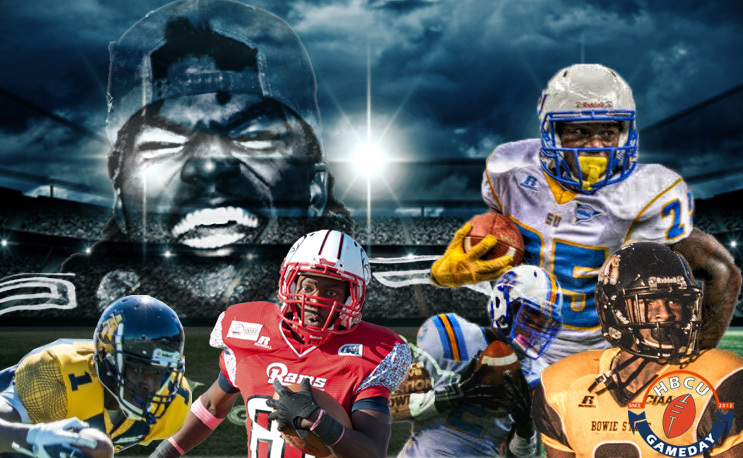 The 2015 season was a breakout one for Bowie State. After being a bad-to-irrelevant team in the CIAA for a number of years, it finally took a turn for the better that season and Manns was dominant. He caught 83 passes for 1,104 yards and 13 touchdowns while helping Bowie State to an appearance in the CIAA Championship Game and the NCAA Division II playoffs. Like Tarik Cohen, Williams entered 2016 with a lot to live up to. After a stellar junior season all he did was increase his receptions (64 to 90), yards (1,012 to 1,337) and touchdowns (10 to 11), while helping Grambling repeat as Bayou Classic winners, bring home the SWAC title and win the Celebration Bowl. Williams came to Grambling as a quarterback from Baton Rouge, one of Doug Williams’ final recruits. He left four years later with 210 catches for 3,062 yards and 28 touchdown catches, a SWAC title and an HBCU national title before being drafted in the third round by the Arizona Cardinals this spring where he is expected to be the air apparent to Larry Fitzgerald. Quinn is likely the most consistent receiver of the Gameday Era, catching 231 passes over his career, never less than 49 in a season. He finished his career with more yards (3,192 yards) than Williams and added 26 touchdowns and countless broken SWAC defenders ankles. Manns and North Carolina A&T’s Denzel Keyes get the final reciever nods. Keyes made some huge catches in his career (including the game-clincher at Kent State) and helped A&T bring home a share of the MEAC crown twice, including the inagural Celebration Bowl. He also set an A&T record with 25 recieving scores, including a career-high 10 as a senior. Manns was simply a man among boys his last two years and despite missing all but one game as a sophomore in 2014 he finished with career numbers of 198 receptions for 2,959 yards and 27 touchdowns.